With new music from Marina and The Diamonds coming this Autumn, we are taking a look at her musical career through the years. Marina Diamandis, or better known musically as Marina and The Diamonds, tweeted earlier this week a written message to fans letting them know she was on her way to Los Angeles to finish production on her upcoming fourth studio album after a short hiatus from the music industry. Her most recent musical release was a feature on Clean Bandit’s 2017 single, ‘Disconnect’. However, the single has been about since 2015 when Clean Bandit alongside Marina debuted ‘Disconnect’ at Coachella through a live performance during their set. Monday 15th February 2010, the day Marina and The Diamonds released her debut album, ‘The Family Jewels’. After releasing ‘The Crown Jewels’ EP via 679 Recordings a year prior, Diamandis started to build up towards the release of the debut album. ‘The Family Jewels’ spun out five commercial singles in total within the UK with the third single, ‘Hollywood’ becoming her breakthrough hit. ‘Hollywood’ debuted and peaked at number twelve in the UK Singles Charts throughout February 2010 and paved the way for Marina’s career to succeed onto new heights. Lyrically, the single disgraces Hollywood and it’s infectious culture as the chorus opens with, ‘Hollywood infected your brain’. The single as a whole was praised by the likes of Perez Hilton and Kanye West. In August 2010, Marina and The Diamonds released fan favourite track, ‘Oh No!’ as a single. The inspiration for ‘Oh No!’ came after a trip to Los Angeles. Diamandis became inspired by the South Californian city and before she knew it, ‘Oh No!’ was written and just had to make the album’s final cut. Greg Kurstin, who has worked with the likes of Lana Del Rey and Sia, helped in the production of the single as well as producing most of the other tracks from the album. Commercially, ‘Oh No!’ peaked at number thirty-eight in the UK Singles Chart, however, gained its fair share of use in the advertising industry. ‘Oh No!’ was used in an advert for US TV Series, ‘The Big Bang Theory’ as well as in a promo for the third season of MTV’s ‘Awkward’ in 2013. The single was also premiered on the silver screen through Big Brother UK’s spin-off TV show known as Little Brother when Marina and The Diamonds performed ‘Oh No!’ live during the 2010 series. As of 2018, The Family Jewels is certified Gold in the UK and Ireland, with the album surpassing 300,000 sales Worldwide. This was only the beginning of a very innovating musical career for Marina Diamandis, as she quickly began to work on her second album – ‘Electra Heart’. You can buy/stream Marina and The Diamonds debut album, ‘The Family Jewels’ via all available platforms here. After launching her debut album in the US, Marina and The Diamonds wanted to immediately start work on a follow-up album which resulted in ‘Electra Heart’. The album’s concept came from a character created by Diamandis herself, whom she also portrayed throughout the album’s run. Electra Heart’s persona was described as, ‘a cold, ruthless character who wasn’t vulnerable’, which could also be demonstrated within the album musically. Electra Heart was inspired by a femme fatale of women, from Madonna to Britney Spears. Along with a concept album, Marina and The Diamonds also delivered visuals by filming accompanying music videos for some of the album’s tracks. They would initially story-tell the life of Electra Heart visually. There were a total of eleven music videos for the trilogy, with the final part being a non-album track going by the same of the album – ‘Electra Heart’. Commercially, Electra Heart projected Diamandis onto a higher platform and strengthened a loyal fanbase for the Welsh singer-songwriter, mainly consisting of the Tumblr generation back in 2012. Electra Heart’s lead single, ‘Primadonna’ was released a month prior to the album’s official release and became a commercial success for her. ‘Primadonna’ peaked at number eleven on the UK Singles Chart, with a position of 113 in the year-end charts. The single also charted highly in many other European countries throughout the initial release. “Primadonna’ still remains one of Marina and The Diamonds’ most commercially successful singles to date. Lyrically, ‘Primadonna’ explores the lifestyle of being a literal Primadonna. Diamandis opens the track with the lyrics, ‘Primadonna girl, yeah / All I ever wanted was the world.’ As for the accompanying music video, we see Diamandis or should we say, Electra Heart strut around a mansion posing into the camera wearing her signature platinum wig as she sings along to the track. A highlight from the Electra Heart era was the ‘How to Be a Heartbreaker’ music video, which was part 7 in the visual trilogy for the album. The track’s music video consisted of Electra Heart flaunting in a communal shower full of rather good-looking men, who we could suggest to be male underwear models. Within the track, the Welsh singer-songwriter literally talks you through How to Be a Heartbreaker with four simple rules, you too could be a heartbreaker just like Electra Heart! Due to the appeal of the single’s music video, ‘How to Be a Heartbreaker’ followed suit of ‘Primadonna’ and charted within many European countries, the track also became certified platinum in Denmark. The single gained stateside appeal, being covered by the cast of Glee in an Season 4 episode titled, ‘Feud’. As of 2018, Electra Heart is Marina’s second album to be certified gold by BPI, selling over 100,000 units in the UK. Globally, the album has surpassed an estimated 800,000 units as of January 2018. You can buy/stream Marina and The Diamonds sophomore album, ‘Electra Heart’ via all available platforms here. Last but not least is the Froot of the tree, Marina and The Diamonds’ third studio album, ‘Froot’, which was released in March 2015. Following-up Electra Heart was never going to be easy for Marina, however, she outdid herself on this honest and personal album. Sticking to concepts, leading up to the album’s official release, Diamandis came up with the concept – Froot of The Month. This concept consisted of Diamandis releasing a material related to Froot until the album, as a whole, was released. Froot of The Month involved the release of the title track on her birthday, unveiling the album’s artwork and pre-order along with a few other tracks. With vinyl releases making a comeback, Marina and The Diamonds seized a dynamic opportunity with one of the album’s formats. 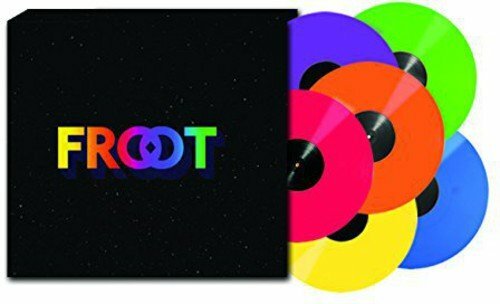 Froot was not only released digitally and physically, it was also released via a limited edition boxset consisting of 7″ ‘Scratch and Sniff’ LPs. What better way than beginning our venture into the Froot than starting with the title track. Released on 10th October 2014, the title track was treated as a present to fans from Marina on her birthday. ‘Froot’ was a unique sound for Diamandis, sounding sonically different in comparison to her two previous records. Nevertheless, the loyal fanbase was still backing the new era from Marina and The Diamonds. Although, Froot was never initially released as a commercial single, it did receive impressive critical acclaim as well as a fanfare reception. The whole track was a metaphor, with Diamandis constantly referring to herself or her emotions as fruit – ‘It’s summertime and I hang on a vine’ / ‘They’re gonna make me into sweet red wine’. Visually, Froot didn’t have the same concept as Electra Heart. Within the album, it was only singles which received music videos. Diamandis ended the Froot era with the album track, ‘Blue’. Filmed at Dreamland Pleasure Park in Margate, UK, Marina and The Diamonds delivered yet another radiant and cinematic music video. Popping with vibrant colours, we see Diamandis make her way through the theme park through day and night from the roller rink to fortune telling. Lyrically, ‘Blue’ entails the breaking up of a relationship and the emotional toll it has taken on Marina. Describing the emotional rollercoaster as not wanting to ‘feel blue anymore’ within the song’s chorus. ‘Blue’ was the perfect choice for a farewell from the Froot era as it gave fans an insight on how the Welsh singer-songwriter feels in everyday life. As the era faded, Diamandis decided to take a hiatus from her musical career to focus on her mental health. Froot debuted at number ten on the UK Album Charts in March 2015, although it did debut at number eight on the Billboard Hot 100 in the US, becoming her stateside peak. Froot also charted moderately well within Europe and Oceania. As of 2018, the album sales are unknown but it is estimated to have sold 500,000 units. You can buy/stream Marina and The Diamonds latest album, ‘Froot’ via all available platforms here. What do you think of Marina and The Diamonds? Which album is your favourite? Are you excited for new music? Let us know on Facebook and Twitter @CelebMix.